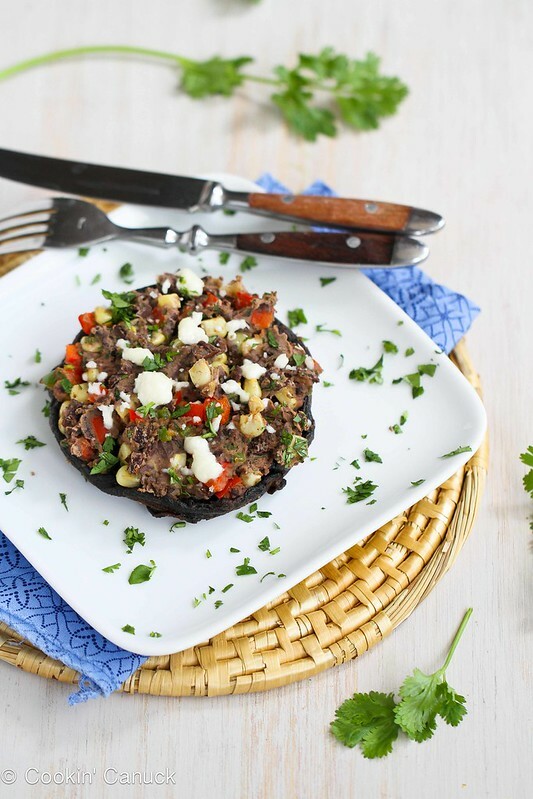 These stuffed portobello mushrooms are filled with southwestern flavors and are a fantastic vegetarian recipe option for Meatless Monday. 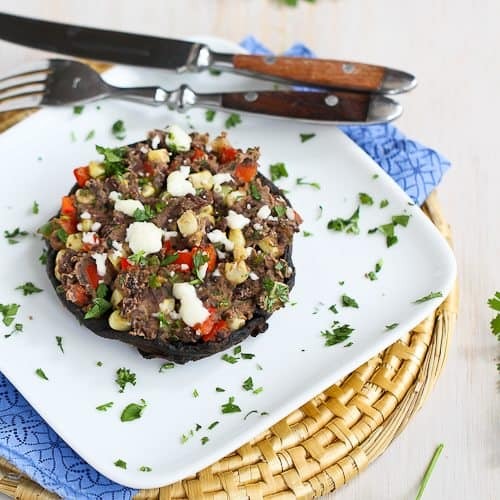 Whether you follow a strict vegetarian diet or only don your meatless hat for Meatless Monday, these stuffed portobello mushrooms are worthy of a spot in your recipe rotation. 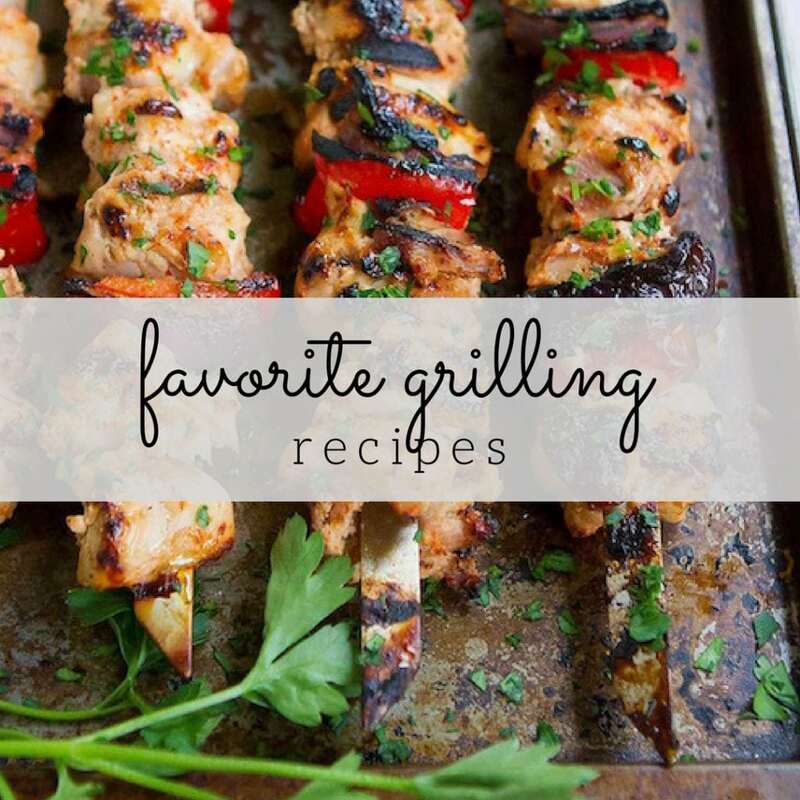 Several weeks ago, I posted my Top 10 Vegetarian Recipes for the Grill and am now determined to keep making new contenders for that list. The cumin black beans are inspired by these Southwestern Eggs Benedict. The smashed bean mixture makes a fantastic filing for sandwich wraps or enchiladas. 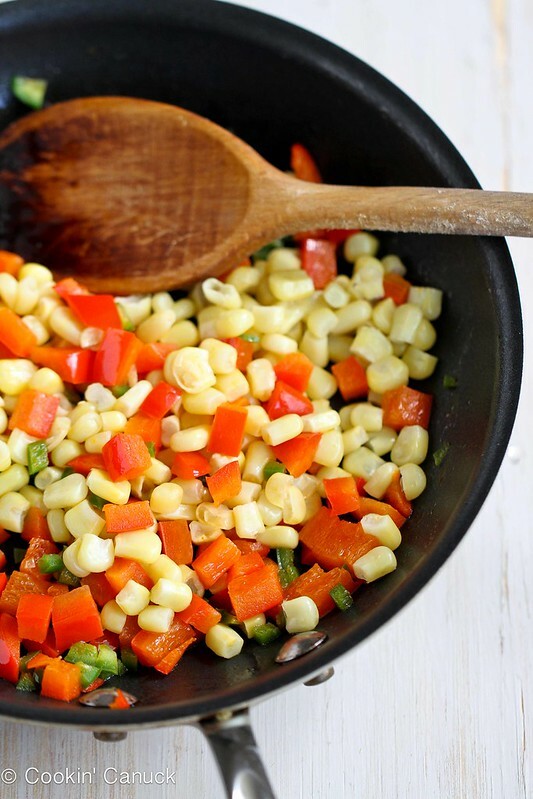 In this case, it got dressed up a bit with red and jalapeño peppers, and sweet corn kernels. Not only are mushrooms a good source of vitamin B and the antioxidant selenium, but they are one of the heartiest vegetables found in the produce section, producing feelings of satiety. In other words, you won’t be as tempted to scarf down copious bowls of ice cream after dinner. Maybe just one bowl. Everything in moderation, right? Believe me, I’m not crazy enough to suggest that you (or me) give up ice cream! (a Mexican cheese found in most supermarkets). If you want to make this meal vegan, just leave out the cheese. In a large shallow dish, whisk together the white wine vinegar, 3 tablespoons olive oil, 1/4 teaspoon salt and 1/4 teaspoon pepper. Add the mushrooms, turn to coat and let rest for 20 minutes. Preheat the grill to medium-high heat. Brush the grill with canola oil. Stir the cumin, 1/4 teaspoon salt and 1/4 teaspoon pepper into the black beans. Heat the remaining 1/2 teaspoon olive oil in a medium skillet. Add the garlic and saute for 30 seconds. Add the red bell pepper and jalapeño pepper, and cook, stirring occasionally, until the peppers are tender, about 3 minutes. Stir in the corn kernels. 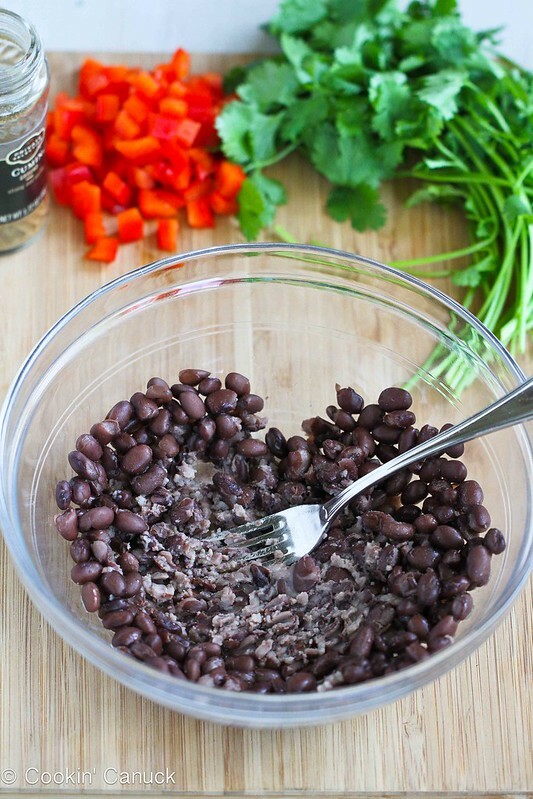 Reduce the heat to medium-low and add the black bean mixture, stirring until the mixture is heated and combined. Place the mushrooms on the grill, gill side down, and cook until the mushrooms are tender, 3 to 5 minutes per side (depending on the thickness of the mushrooms). evenly between the 4 mushrooms. Garnish the mushrooms with minced cilantro and serve immediately. Top with salsa and diced avocado, if desired. In a large shallow dish, whisk together the white wine vinegar, 3 tablespoons olive oil, ¼ teaspoon salt and ¼ teaspoon pepper. Stir the cumin, ¼ teaspoon salt and ¼ teaspoon pepper into the black beans. Heat the remaining ½ teaspoon olive oil in a medium skillet. Add the garlic and saute for 30 seconds. In the last 2 minutes of cooking, divide the black bean mixture and the queso fresco evenly between the 4 mushrooms. Stuffed mushrooms are the best! 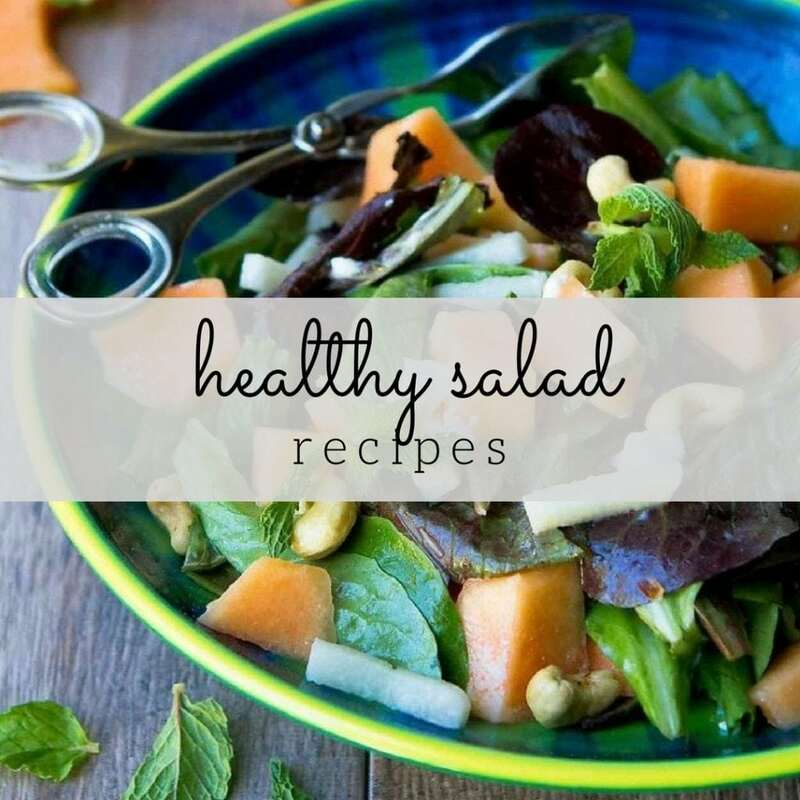 Love this recipe especially – it’s so healthy! 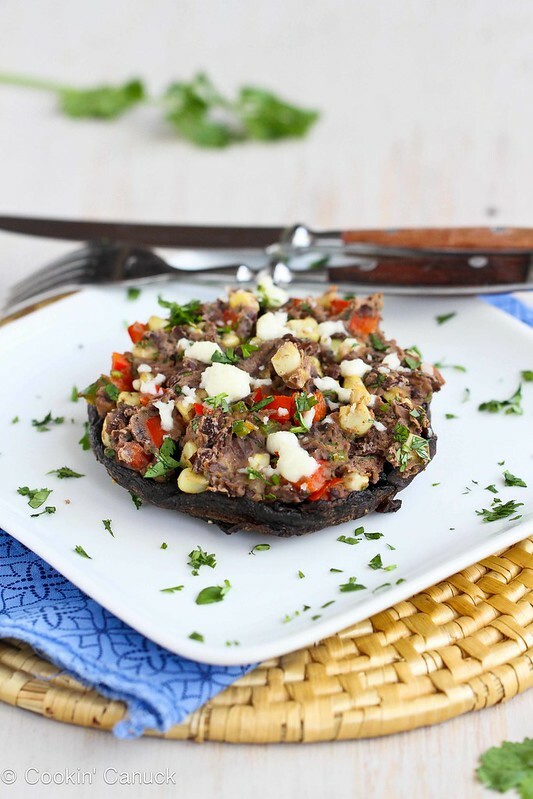 I posted vegetarian stuffed portobellos too today! Great minds! Mmm! This could be my new favorite meal!! I the southwest flavors, black beans and grilled mushrooms. Plus, these are so simple! Yeah! 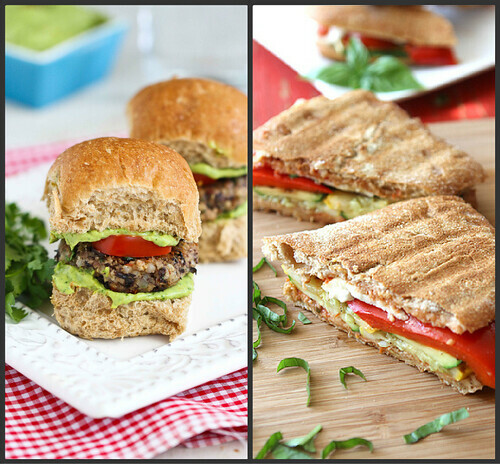 Portobello mushrooms are basically my savior in the summer months… I’m not a huge steak girl… These look perfect! Mmmm! Love stuffed mushrooms! These look delicious and healthy! 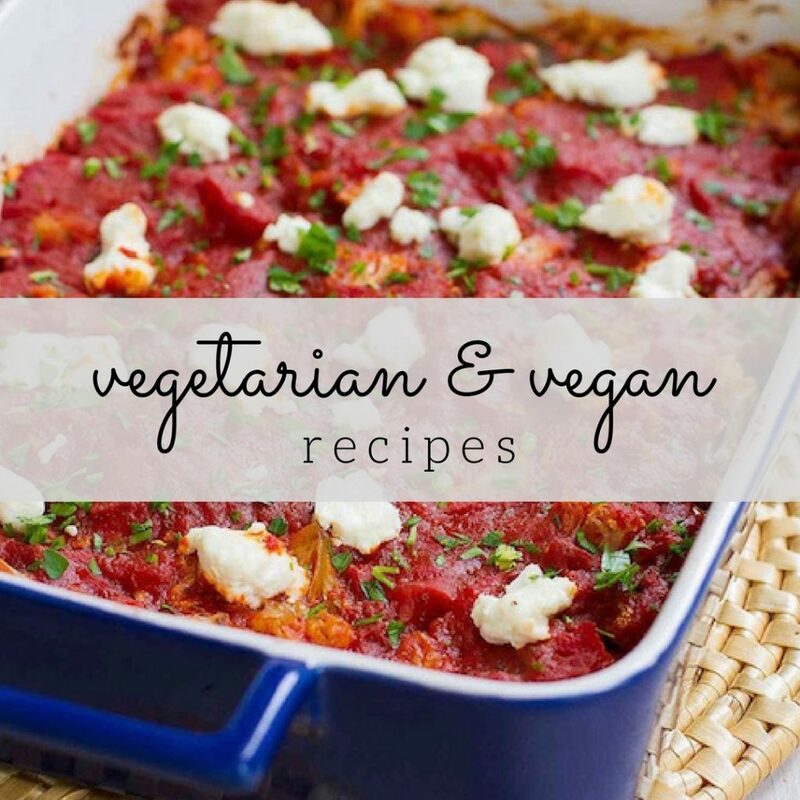 I love mixing meatless meals in throughout the week, and this looks delicious! I’ll have to add it to the menu. 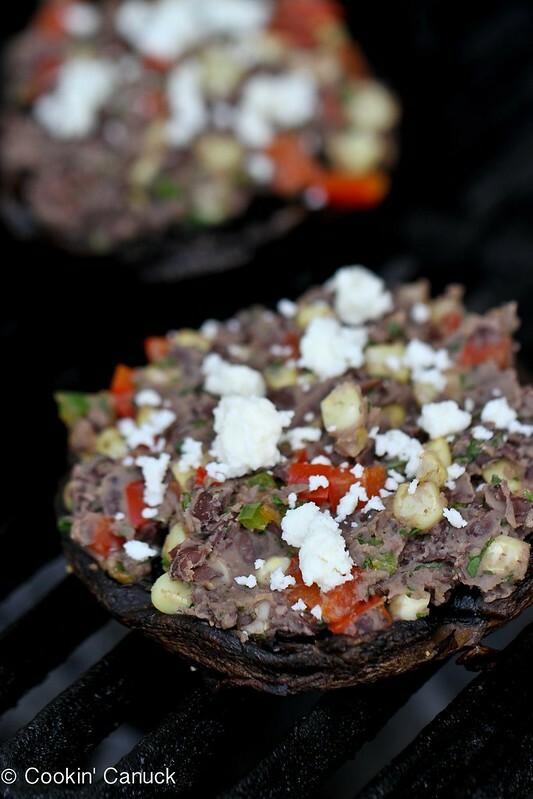 I love stuffed mushrooms and the fact that you grilled these! Dara, this looks great! Who needs meat when you have a meal like this! Mmmm. This is interesting. often stuff mushrooms but didn’t think of this combo. Quite filling too I would imagine. I’m inspired now! Great post. Dara this looks so healthy and filling! Love all the flavors too! This is such a scrumptious, wholesome idea for meatless meals! Thanks for sharing, Dara! I love Stuffed Portobelloes! One of my favorite meals! What a great vegetarian dish!! Oh wow, this recipe looks fantastic! I love portobella burgers, and this recipe really looks perfect.